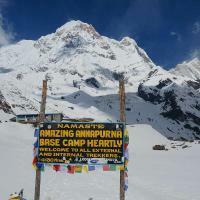 One of the most impressive and beautiful ways to approach the majestic Annapurna Mountains is a trek through the extraordinary alpine landscape to Annapurna Basecamp. Your trekking adventure starts in the lower regions where rice paddies and rhododendron forests will fascinate you. Along the Modi Khola river you will slowly climb higher where a breathtaking scenery is waiting for you. The massive Annapurna peaks as well as the unique Machapuchre (Fishtail Mountain) seem to be just a stone throw away. Come with us on this unforgettable journey. After an early breakfast we will go on a 6 hour drive to Pokhara. By tourist bus you will travel the Nepalese Highway with beautiful sceneries. Pokhara is the beautiful gateway to the Annapurna Mountains and one of the best places of Nepal which combines all: mountains, rivers, lakes and lifestyle. Your trek starts after a two hour drive from Pokhara. After about one hour walk we will reach the Annapurna Conservation Area Project Counter where the trekking permits will be checked. 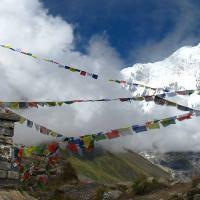 HappyHari Trek will prepare your permits in advance. There are several nice places to have snacks or lunch or simply get refreshed before reaching our place for the night at Tikhedhunga. This is one of the famous parts of your trek leading you through beautiful rhododendron forest up to Ghorepani. It is a long uphill climb today but the views will reward you for this exercise. We get up early morning to give an appetizer for today. 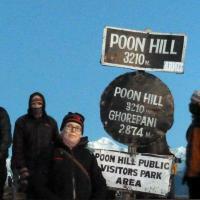 After an easy one hour climb we will reach Poonhill just on time to see the sun rise behind the Annapurnas. After breakfast we continue our journey to Tadhapani with more beautiful mountain views. We start with a downhill trail through forests and with great mountain views. We will descend until Kimrong River. After crossing the river we will climb up to Chhomrong which is probably one of the biggest Gurung village in this area. Early morning well managed steps will lead us down the jungle trail with a couple of tea-houses along the way where we can stop for food and drinks until we reach our overnight stay at Dovan. Our journey follows the Modi River which originates from the Annapurna Glacier. This trail will take us through like a mountain gorge looking place. Today is the day you were waiting for. 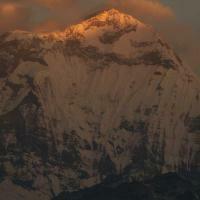 We will reach the Annapurna Basecamp with close and stunning views of all Annapurna Mountains. After having enjoyed the Basecamp we will take the same trail we came from down until Bamboo. We will come again to this Gurung Village and stay over night. This is our final trekking day. Some easy and gentle trails will lead us to the finishing point of our trek. A vehicle to take us back to Pokhara will be waiting for us. We leave early as the drive on the tourist bus to Kathmandu will take about 6 hours. In the afternoon you can relax or go for some final souvenir shopping.